Who cares if it's a laptop replacement as long as you're getting your work done? These accessories can help. 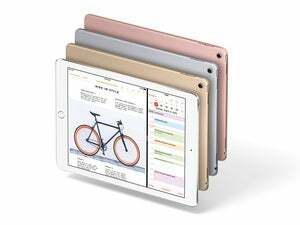 The last time we took a look at extra tools and accessories to help you get more work done on an iPad, the iPad Pro was nothing more than a glass slab of rumors. As we now know, the iPad Pro is very real. Whether you’re thinking of picking up an iPad Pro, or already have one and want to get more out of the tablet, here’s some accessories I’ve found that make working on the iPad Pro a breeze. 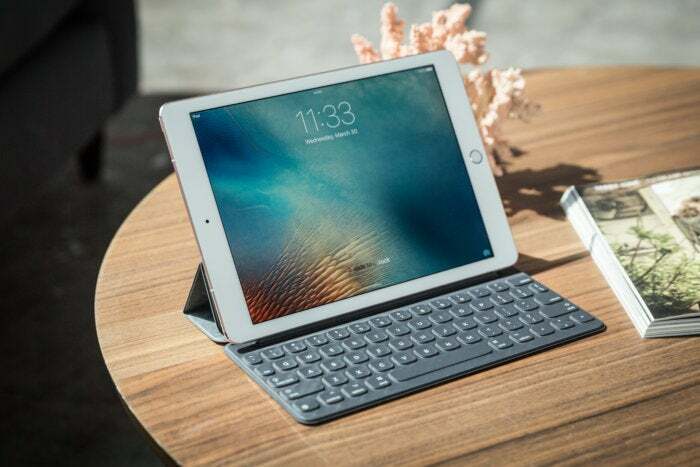 There are a several Bluetooth enabled keyboards available for both sizes of iPad Pro, but they’re often bulky and require charging. It only makes sense to use a keyboard that takes advantage of the iPad Pro’s Smart Connector. Apple’s Smart Connector provides power to the keyboard, and provides two-way communication between the keyboard and iPad Pro. The Smart Keyboard never needs charging and pairs automatically thanks to the Smart Connector. 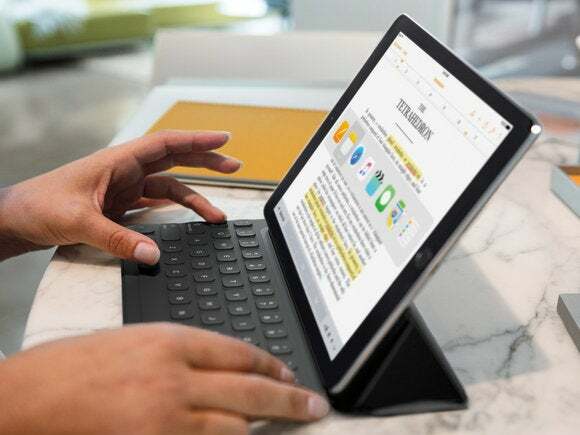 Unfortunately, right now there’s only two options for the 12.9-inch iPad Pro: Logitech Create and Apple’s Smart Keyboard. For the 9.7-inch iPad Pro, so far only Apple’s keyboard uses the Smart Connector. I’ve tested Logitech’s Create keyboard and found it to get the job done, however it was bulky and difficult to take the iPad Pro out of when needed. Apple’s Smart Keyboard is currently the best Smart Connector-enabled typing accessory for either iPad Pro model. 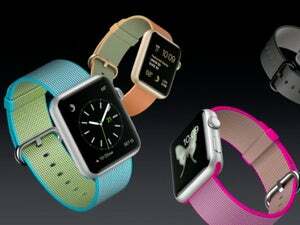 The 12.9-inch model retails for $169, while the 9.7-inch model can be had for $149. With only one port on the iPad Pro, it’s only natural you’ll need to purchase an adapter or two. When it comes to official adapters from Apple, you can choose between the $39 Lightning to USB 3 Camera Adapter, the $29 Lightning to USB Camera Adapter, or the $29 Lightning to SD Card Camera Reader. 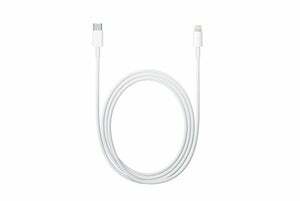 Apple call it the Lightning to USB Camera Adapter, but it can be used to connect a variety of USB devices to your iPad Pro. With that said, if you own the 12.9-inch iPad Pro you should limit your options to the SD Card Reader and the Lighting to USB 3 adapter. Why? Because those two adapters offer USB 3.0 support, and only the larger tablet is equipped with the same technology. A USB 3.0 connection will decrease the amount of time you spend waiting for photos and videos to transfer from your camera or card to your iPad Pro. I currently carry the Lighting to USB 3 adapter. Not only can I connect USB devices to my iPad Pro using this adapter, I can continue to charge the iPad Pro through the Lightning port on the adapter. Plus, you can use it to connect USB microphones, keyboards, and Ethernet adapters to your iPad. As I mentioned in my last column, you can cut the amount of time it takes to fully charge the 12.9-inch iPad Pro in half when using Apple’s 29W power adapter and a USB-C to Lightning cable. This Lightning-to-USB-C cable lets you use the 29W USB-C power adapter (that typically comes with the 12-inch MacBook but is also sold separately) to charge your iPad Pro in half the time. It’s something Apple should include with every iPad Pro, but until then it’s something every iPad Pro user should pick up. The adapter itself is $49. In addition to the adapter, you’ll need a USB-C to Lightning cable. You can get a 1-meter cable for $25, or double the length to 2 meters for $35. My tests have shown the standard 12W power adapter will charge the iPad Pro in 5 hours, whereas the 29W adapter cuts that time in half, to 2.5 hours. I’m not sold on the Apple Pencil as a must-have accessory. I rarely every use mine, save for the occasional jotting of notes and game of SketchParty TV after its latest update. 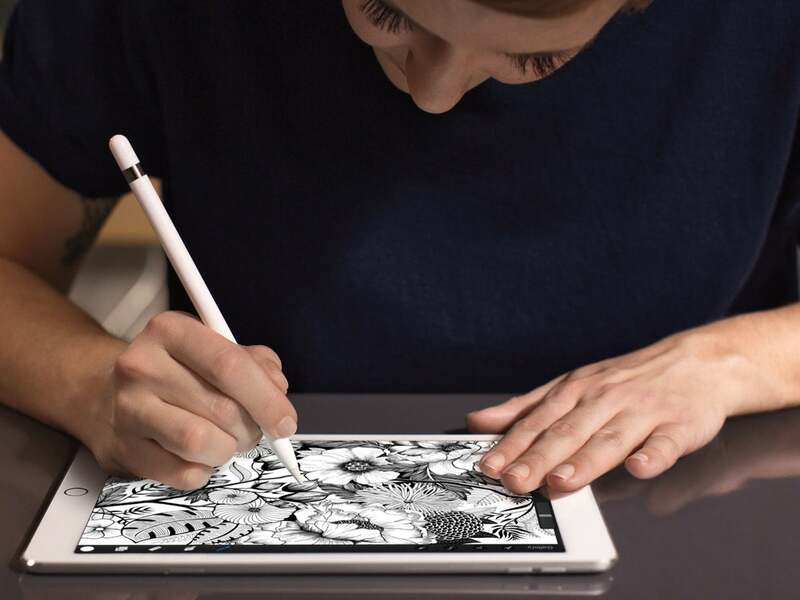 Since the iPad Pro is the only iPad that can use the Apple Pencil, that's your best choice for a smart stylus. Still, the Pencil is easily the best digital writing and sketching experience available on the iPad Pro. And for those who often need to sign documents, sketch product designs, or take notes in class, the Apple Pencil is the tool you want to have on hand. With WWDC just around the corner, hopefully we will learn more about Apple’s future plans for iPad Pro, not only in terms of software, but also in allowing access to its Smart Connector. More importantly, hopefully Apple will begin giving more than just Logitech access to the connector’s tech. As we recently saw with the Logi Base charging stand, we’re only beginning to learn just how many tricks the connector has up its sleeve.